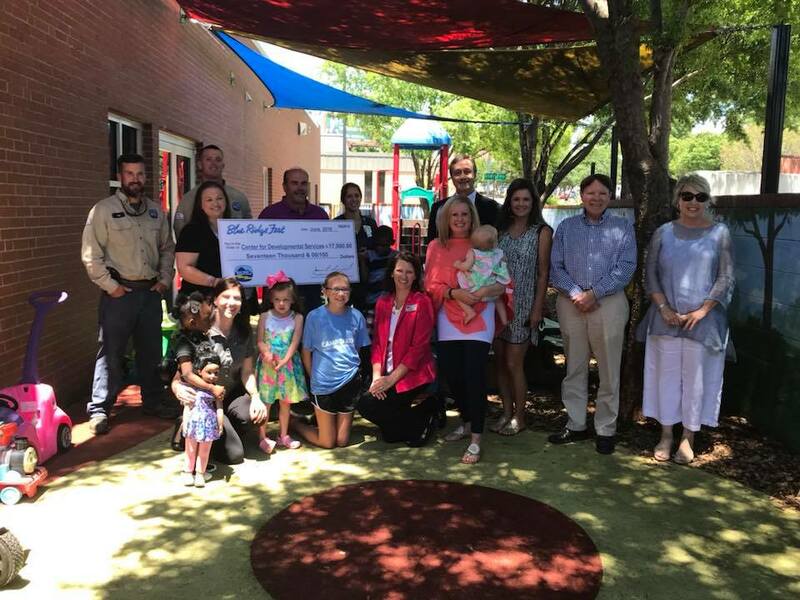 Greenville, S.C. (July 12, 2018): Blue Ridge Electric employees Jay Bagwell, Chad Davidson, and Jessica Stone presented a check for $17,000 from the 21st annual Blue Ridge Fest to Center for Developmental Services. Accepting the check on behalf of the organization is Executive Director, Dana McConnell, Director of Development, Joy Blue along with parents and children from Developmental Services. Also in attendance were Blue Ridge Fest sponsors Tony Cvetko of Integral Solutions Group, Andy Pickens of Andy Pickens Design, Elise Nichols of the Hughes Agency, Lee Alexander of 103.3/95.9 EARTH-FM, and Cathy Tabor of Salem Media Group. Blue Ridge Fest attracted nearly 6,000 attendees and more than 400 classic cars from across the Southeast to benefit twelve local charities in the cooperative’s four-county service area. Since the inception of Blue Ridge Fest, the event has raised nearly $2.8 million for Upstate charitable organizations. CDS is the largest multi-disciplinary treatment facility in the Upstate for children with disabilities and developmental delays. In one location, children receive services in therapy, diagnosis, legal help, day care needs for the medically fragile, and a family support network. The partnership is comprised of Clarity; Family Connection of SC; Medical-Legal Partnership; KidVentures of Thrive Upstate; and four programs of the Greenville Health System: Developmental-Behavioral Pediatrics, Kidnetics, The Wonder Center, and Prosthetics and Orthotics. CDS and its partners serve over 7,600 children and their families each year on property donated by the First Presbyterian Church at 29 North Academy Street in Greenville. For more information about CDS or its partners, visit www.cdservices.org.